Starmobile continues to lead innovation in the competitive smartphone market as it introduces ‘Super Pack’, a new bundle offer designed to deliver a complete out-of-the-box experience for Filipino smartphone users. For its initial outing, Starmobile partnered with Smart Communications, Inc. to provide customers with free 700MB of data access every 30 days for 12 months. The exclusive Smart Prepaid SIM comes included in the box with a purchase of the new Starmobile PLAY Neo Android smartphone (P2,990). “Through this amazing offer, Smart Prepaid brings the Smart Life experience to even more Filipinos, giving them free data to enjoy all their favorite mobile apps on a feature-packed device like PLAY Neo,” said Evelyn Jimenez, Prepaid Marketing Group Head. “Smartphone users can rely on the widest breadth of content offerings from Smart that instantly turn their device into an entertainment powerhouse to enjoy mobile games, music, movies and more as they wish,” she added. To avail of the free data allocation, users need to top up an accumulated amount of P150 every month. Once the requirment has been reached, a text prompt will notify them of their free allocation. 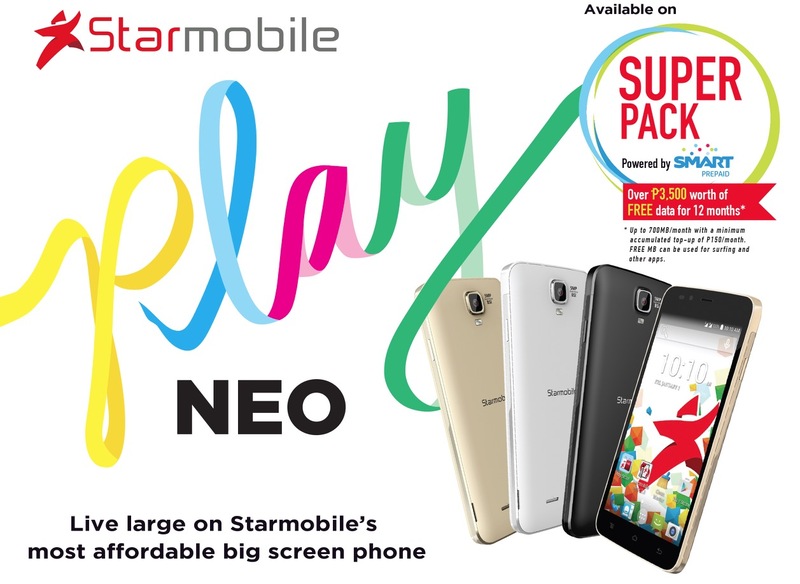 The Starmobile PLAY Neo is Starmobile’s most affordable 5-inch smartphone. It sports the largest screen for an entry-level phone making it ideal for surfing and enjoying apps such as Facebook, Instagram, Twitter, and Clash of Clans. Socially-active netizens will love the 5-Megapixel autofocus camera with BSI (backside illumination) which is more capable of shooting in low-light scenarios compared to non-BSI cameras. In terms of speed, the PLAY Neo has a capable quad core processor allowing it to run games with ease and a large 2000mAh battery that can last for up to 4 hours for calls and 10.4 days on standby. “There is simply no reason to not get the PLAY Neo: it’s a great phone, with great specs, and a great bundle,” said Chen. “It’s the easiest step into a world of endless entertainment,” he ended.